This one is probably my favorite. 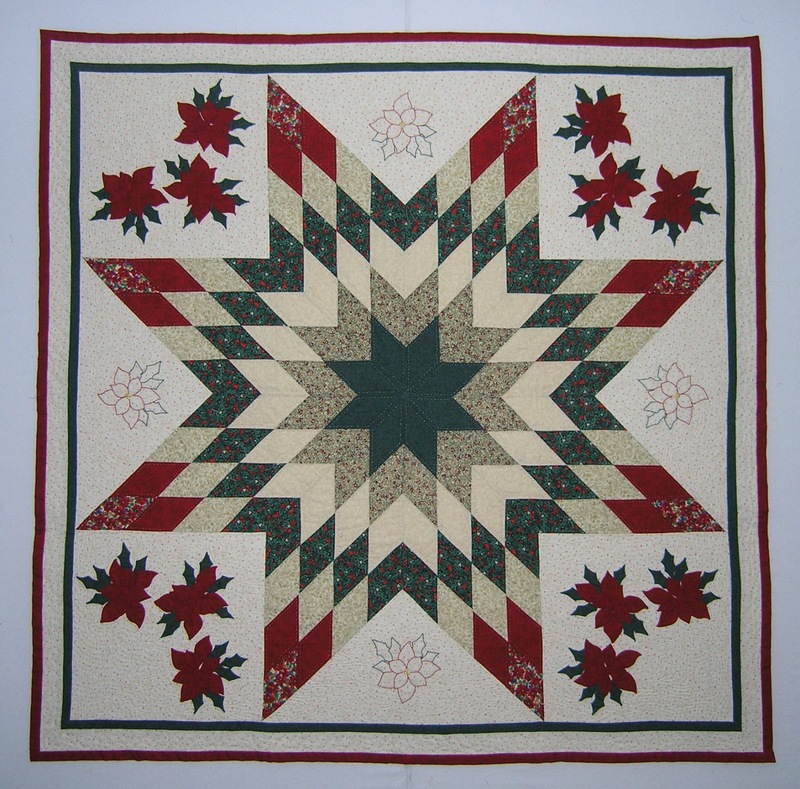 I made it in 2007 from blocks I received in a quilt guild row-robin. 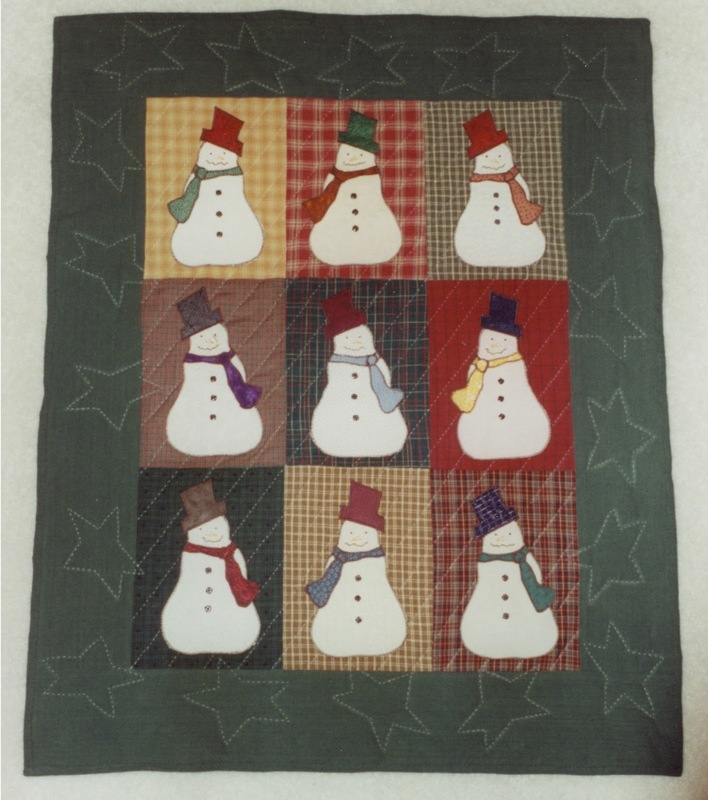 Each person in the group made a row using the Christmas fabric I had provided. When I got it back I didn't love it. Naturally, there was only one thing to do - take it apart and put it back together in a different layout. It took a lot of imagination to come up with this plan, and I had to add the piano key border make it more balanced. It's about 47" by 57". 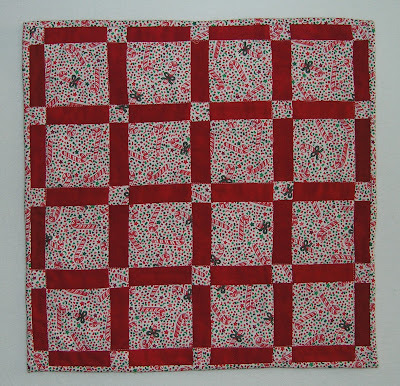 I call it "Christmas Hodge-Podge" and it's the perfect snuggle quilt! I love how it looks draped over the chair next to the chair with my snuggle quilt! ..... and makes a great table topper! 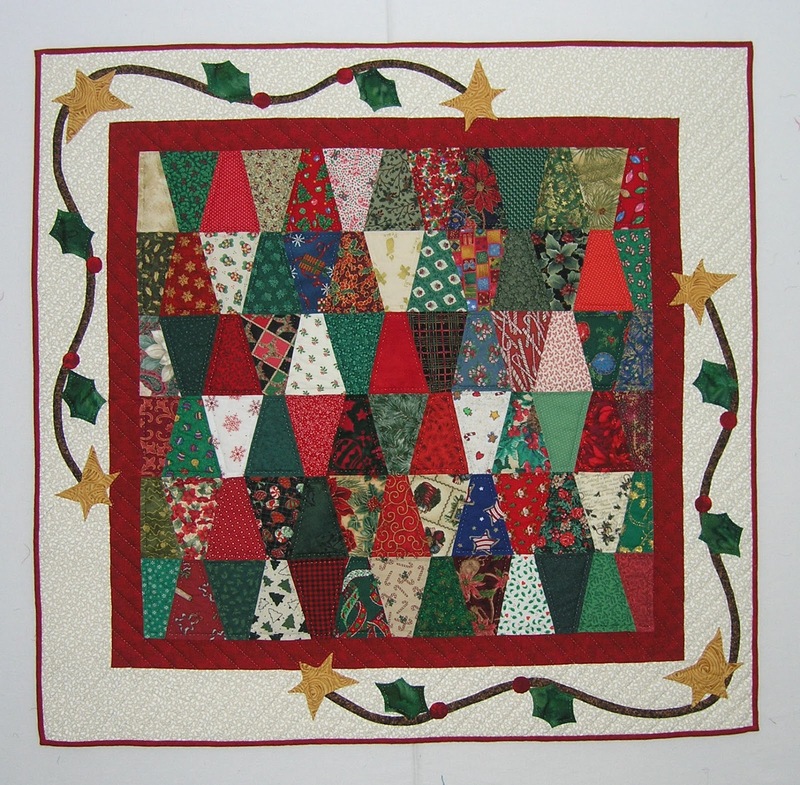 When my son was setting up his own home in 2002 I made a tree skirt using a pattern from American Patchwork and Quilting Magazine for him. I also made him this little snowman wall-hanging from a McCalls Quilting Magazine pattern. It was one of the few times I worked with homespuns, and I really like how it turned out. 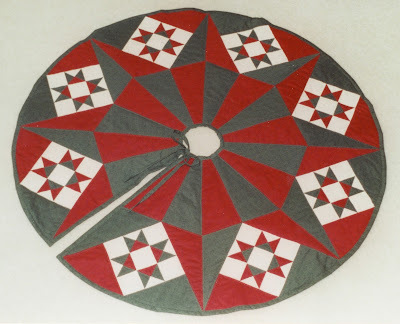 The third thing I made for him is this 28" by 43" wall-hanging called "Cranberry Township" from Quiltmaker Magazine. 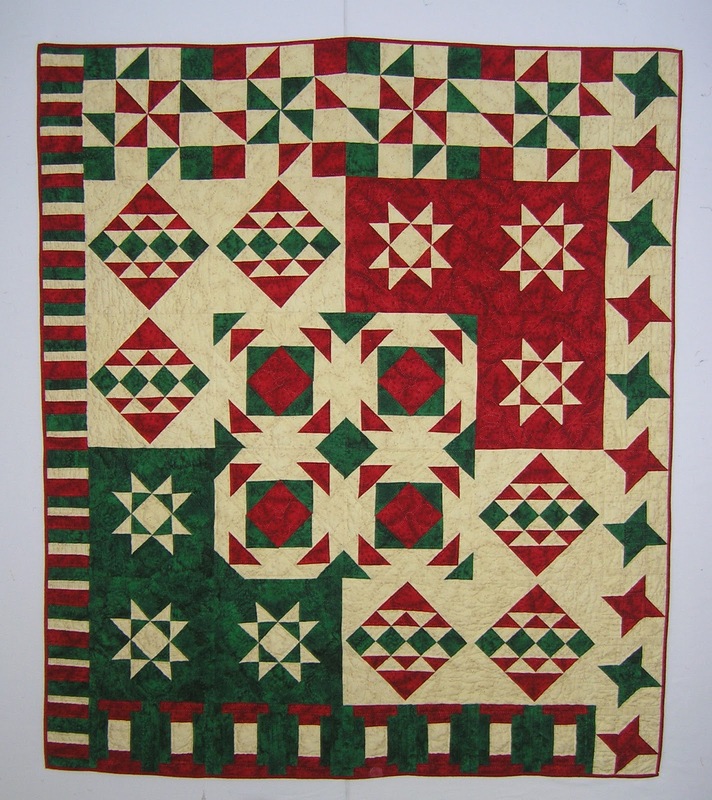 Like all the quilts above it's hand-quilted! ..... and just the right size! 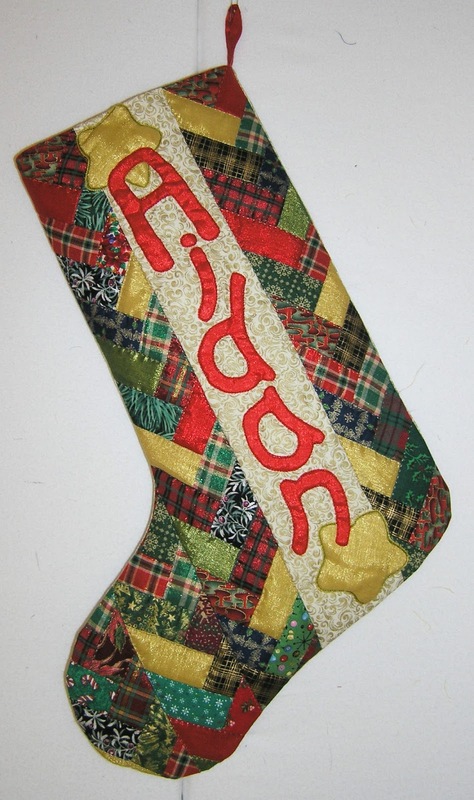 In 2008 when our grandson, Aidan, needed a Christmas stocking, I found the perfect pattern in the 2002 issue of Quilt It For Christmas. I used some lame' fabrics in Christmas colors along with a few cotton prints and appliquéd his name and some gold stars to make it extra special. I really hope you've enjoyed this Christmas Show and Tell. I sure had fun putting it together! 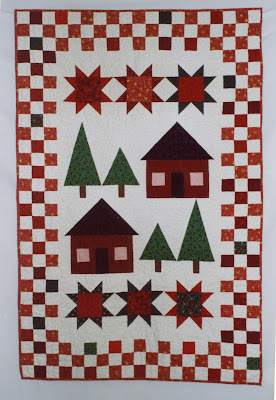 I remember when you re-worked that row quilt. I was (and still am) very impressed with the results. Good way to make it yours! I was in the swap. I'm absolutely sure, because I recognize the fabrics! That's one project I actually finished. 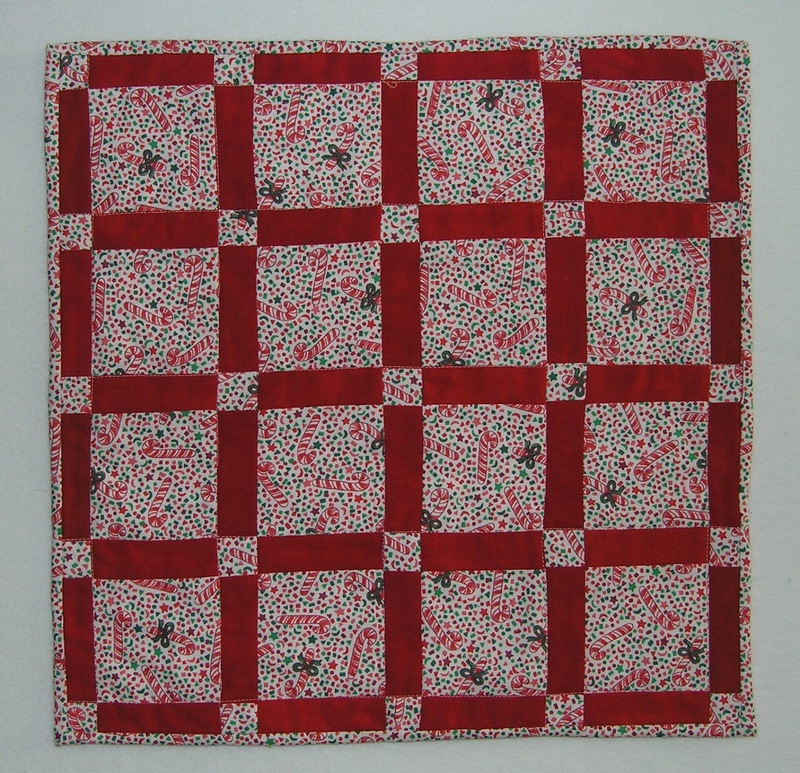 I added fabric from one or two more swaps, made a 60-inch throw quilt that I am using as a bed topper this year. Love that table topper. 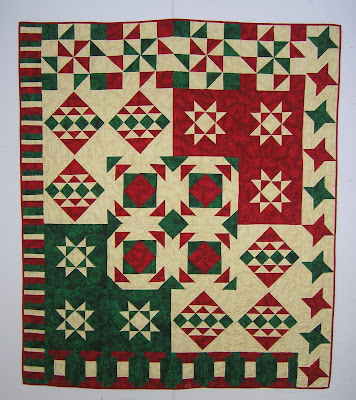 Lots of pretty quilts. Merry Christmas! I love the look of the table topper and Cranberry Township, but most of all, I enjoyed reading the stories behind each one. A charming post on Quilts of Christmas Past! 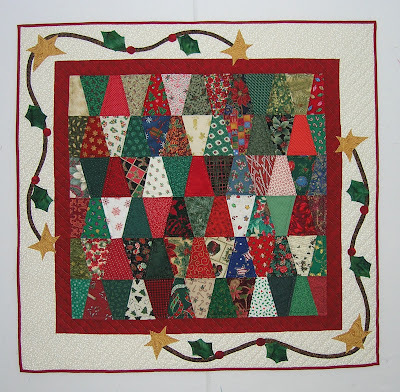 Wow, fun to see your Christmas quilt show and tell! 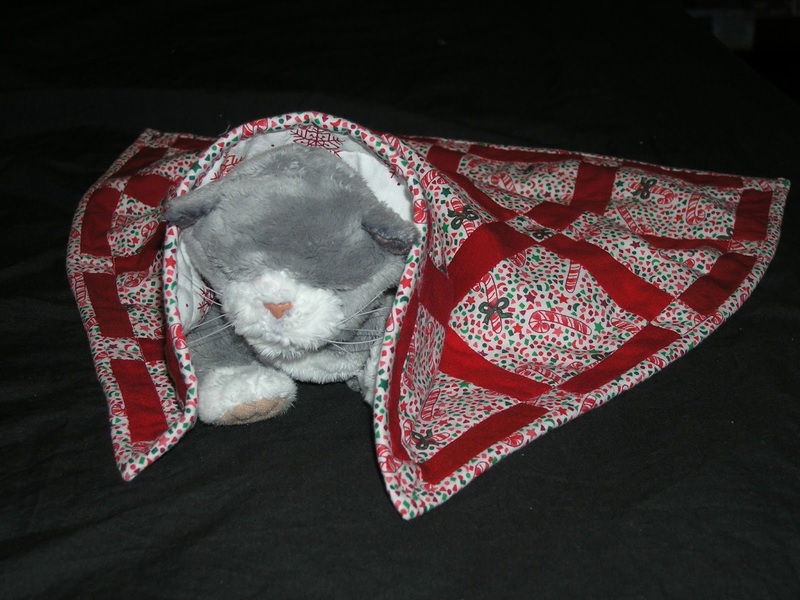 The kitty + quilt photo is too cute!!! Hi Sandy, that was a great Christmas show and tell. 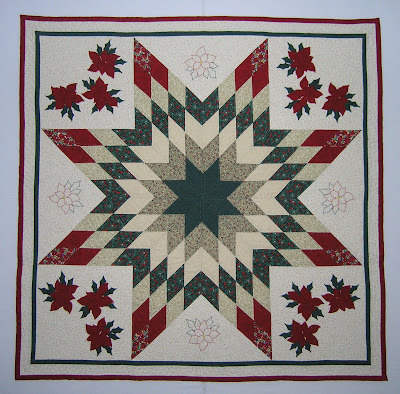 Thanks for sharing your quilts with us!